All Years, Makes and Models are Welcome! The Greater Pittsburgh Chapter of the ATCA will be having their Annual Chapter Show in conjunction with our show! We would like to extend a warm welcome to all Chapter Members! Check out the Show's Official Radio Station! Our ads will run several days before the show! 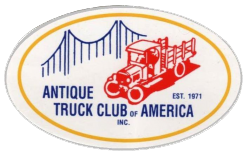 Visit BigMackTrucks.com Antique, Classic and Modern Mack Truck Support Forums! There are two hotels that are within 10 miles of the show grounds.